Horseradish granules are obtained from the horseradish spicy and bitter root, which is relative of the mustard family. Dried horseradish retains its pungency for longer than grated horseradish which has been preserved in vinegar. Its granules are white with a pungent aroma and releasing a strong hot and sharp taste similar mustard or wasabi. It is considered a versatile spice usually used in uncooked dishes or cold meats that can be used in the everyday cooking. Also, it has been valuated for its medicinal properties. To use, crumble chips and mix with water. Allow 20 min to let the flavour develop. Use with cold meats such as roast and corned beef. It is good source of vitamins and has many health benefits. It contains higher in Vitamin C than orange and lemons. It is a good source of calcium and potassium. Also, it can help to treat cancer and bacteria. 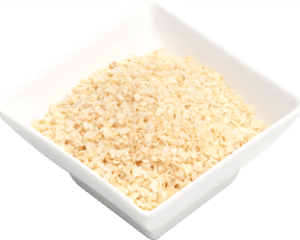 Select high quality horseradish granules with a white colour and pungent aroma. Store in an airtight container in a cool and dry place.